Downing Contracting Company is a small, family-owned company established in 1985. For more than a quarter of a century, we have have been building and renovating homes in the greater Baltimore area. It's likely that we have worked in your neighborhood and we have references available from many of our satisfied customers. We also have a good reputation with local architects and designers. 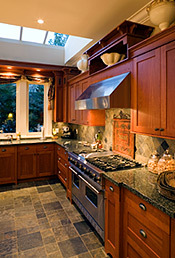 Downing Contracting Company specializes in home renovations and additions. If you desire to stay in your home but it is in need of a makeover, look no further! We are dedicated to providing fine craftsmanship and attention to detail is what we are about. Your satisfaction is also of the utmost importance to us and we know that you want the project finished as quickly as possible. We work one job at a time and don't leave until the job is complete. If you are looking for a reliable, life-long relationship with your contractor, Downing Contracting is your solution! Contact us today for a free consultation or estimate.